Team, we’ve made it to the end of the year. I’d like to take this opportunity to say a very large, Christmas-wrapped thank you to all the authors who have participated in bookclub this year. Authors are usually pretty busy people, but everyone I’ve contacted during the course of 2016 has been unfailingly generous of their time, and given us all the chance to have a good chinwag on Facebook, or provided thoughtful replies to the (slightly silly) questions I ask on behalf of bookclub, all in an effort to give us some insight into the writing process or the book we’ve read. So thank you to (in receding order) Jay Kristoff, Amie Kaufmann (Gemina), Kirsty Eagar (Summer Skin), Dianne Touchell (A Small Madness), Ali Cobby Eckermann (Ruby Moonlight), Ambelin Kwaymullina (The Interrogation of Ashala Wolf), Chris Currie (Clancy of the Undertow), Dave Burton (How To Be Happy), Simmone Howell (Notes from the Teenage Underground), Alison Goodman (Lady Helen and the Dark Days Club) and Lili Wilkinson (Green Valentine). Bookclub has been kicking on for over 14 months, and this brings me to another thank you – I’d like to say thanks to all of you! Any group is only as strong as its members, and bookclub is going great guns. We have over 400 members now, from Australia and other places far away, and if I could hug each and every one of you, I would! (maybe next Christmas, over a few drinks, lol) You have all made this group happen, and you are the ones who make it possible. Everyone has been considerate of each other in comments and posts, and there have been some first-rate book discussions. Loads of people have spread the word about bookclub, tweeted or RT’d, posted on Instagram, Facebooked and Tumbler’d and told their friends via word of mouth – that has made a big difference. It would be just me reading books in the corner on my own otherwise. So thank you, each every team member, for making this bookclub the wonderful place it is. And now – on with the show! 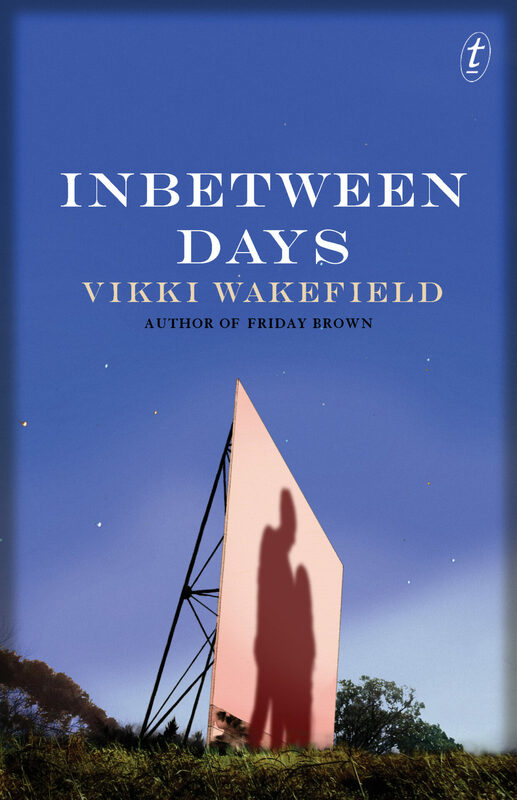 Our final title for this year, which will be the first book we discuss in 2017, is INBETWEEN DAYS by Vikki Wakefield. 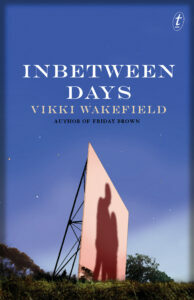 Vikki is an Adelaide author, and apart from being an all-round grouse person (for the non-Aussies, that’s ‘grouse’ as in cool, not ‘grouse’ as in a type of pheasant), she has written some amazing books – including Friday Brown and All I Ever Wanted. Remember you can order through Boomerang Books and receive free shipping by using the ‘loveoz’ promotional code. Also remember, our process for the end of the year is a little different, to accommodate the holidays – I’m going north with my family over the Christmas period, so I won’t be updating or posting anything for bookclub before the week of Monday 9 January. But after that, we’ll have our normal author spotlight post, and then a discussion post in the last week of January 2017. Keep your eyes open for cross-posted alerts on FB, Twitter and Instagram after 9 January. I really hope you enjoy INBETWEEN DAYS, our year-end-finale book! All best wishes from me and my family to you and yours for Christmas and the New Year. I hope you get loads of books from Santa, and may you all have a safe, peaceful and refreshing holiday season – see you in 2017!